includes lighting the lamp with no power connection. High and low pressure sodium bulbs. Audible continuity to 100k ohms. 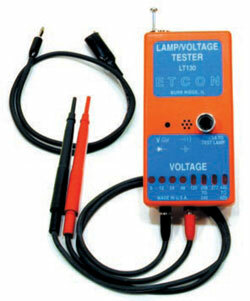 Test ballast capacitors, diodes, igniters and photoelectric controls. Telescoping antenna that fully retracts into the housing. Prod holder for two-handed operation. Neoprene voltage lead and alligator clip assemblies.